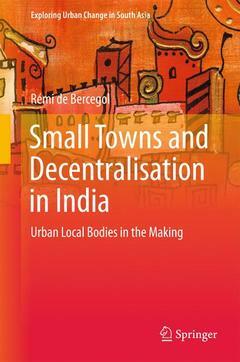 This book examines the impact that decentralisation reforms, initiated in the early 1990s, have had on small towns in India. It specifically focuses on small towns in Uttar Pradesh, one of the most densely populated and poorest states in India. Although considered home to one of the oldest urban civilisations, India remains one of the least urbanised regions in the world. At the same time, the country has many million-strong metropolises that are among the world?s largest megacities, as well as a multitude of small and medium-sized towns and cities. This paradoxical urbanisation, against a backdrop of reforms, has interested the scientific community to gain a more nuanced understanding of the changes and challenges involved. This book analyses an urban environment often overlooked by researchers and public authorities, namely, that of small towns. These towns are of vital importance as this is where the bulk of future urban development will take place. However, decades after implementation of the reforms, the majority of reviews and assessments have focused on large cities and so the impacts of the reform on small towns are still poorly understood. This book includes extensive primary data about political, technical and financial municipal issues in small towns of northern India and, is therefore, of interest to students, researchers and planners working on urban and regional studies in the global South. Chapter 1. Introduction: Understanding the changing urban space in India.- Chapter 2. From theory to practice: Field research in four small municipalitiesin eastern Uttar Pradesh.- Chapter 3. From local to regional challenges: The political profile of the small towns’ municipal councils.- Chapter 4.Between urban imbalances and technical constraints: The challenges of managing local public services.- Chapter 5. From dependence to artificial autonomy: Low financial resources of small municipalities.- Chapter 6.Building the town of tomorrow: The difficult development of small municipalities. Rémi de Bercegol, Ph.D., is a Research Fellow at the French National Centre for Scientific Research (CNRS). He has a doctorate in Urban Planning from LATTS (research group on technology, territories and societies) at ENPC/UMLV, Paris Est, France. He was a Visiting Researcher at the Centre for Social Sciences and Humanities (CSH) in New Delhi between 2008 and 2012. During this time, he undertook research for his book on small towns and decentralisation reforms in northern India. Beyond the scope of India, his research focuses now on world urbanisation and the transformation of cities in the global South, analysed principally in terms of their essential services (water, sanitation, waste management and energy).